Line 30 crosses the northern part of the North-East to the North-West and circulates every hour between Trier and Luxembourg-City. While coming from Trier you can according to your destination, stop in the stations of Wasserbillig, Mertert, Manternach, Wecker, Betzdorf or Roodt/Syre. In order to reach the south of the Moselle region, the following train stations Munsbach and Oetrange are also recommended to exit the train. From all the stations buses will take you to your destination. Alternatively, a car rental service at the main station in Luxembourg will help you out. Line 82 runs along the entire border between Germany and Luxembourg and circulates every hour between Wittlich and Perl. According to your individual destination, you can stop at the stations Oberbillig, Wellen, Wincheringen, Nennig or Perl to cross the bridges or take the ferry to Luxembourg. The Grand Duchy of Luxembourg is equipped with a wide network of Buses . The Moselle area counts several lines which make it possible to connect the various cities of the Moselle with Luxembourg-city and other areas. By car, coming from Trier Follow A1 for Luxembourg. It skirts the area of the Luxembourg Moselle. After crossing the boarder you can take the exits of Wasserbillig, Mertert, Potaschbierg, Flaxweiler or Munsbach according to your destination. Coming from Saarbrucken Follow A6 in direction of Saarlouis. At the intersection with A8, follow the direction of Luxembourg . After Perl, you will cross the Moselle and you joim the south of the Moselle region. Take then N10 "route du vin" or choose A13 in direction of Mondorf-les-Bains. 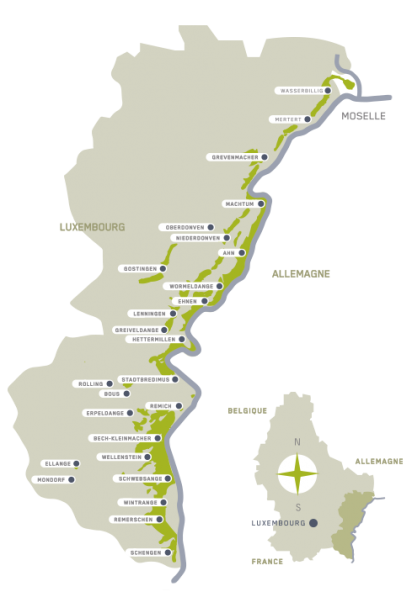 If you come to Luxembourg by plane, you have the possibility of joining the Moselle area by taking public transport starting from the airport. It is also possible to rent a car. If you arrive in one of the airports close to the Grand Duchy of Luxembourg, you can join Luxembourg-City thanks to a shuttle which circulates every hour.